The United States Gulf of Mexico has been a target of large-scale oil and gas exploration for over a century. It currently accounts for 17 percent of the total U.S. oil production and 5 percent of the total gas production. The area has historically been the testing ground for new drilling technologies promoting rigs capable of operating 250 miles offshore in ocean depths greater than 10,000 feet. 9,600 km2 multi-client M-WAZ survey located in Mississippi Canyon and Viosca Knoll protraction areas of the Central Gulf of Mexico and was acquired to better image deep structural elements while improving subsalt and salt flank illumination. Through integration with TGS’ underlying orthogonal Justice WAZ 3D survey, Declaration provides broadband multi-azimuth (M-WAZ) data with offsets to 16 km with single pass vessel configuration derived from CGG’s StagSeisTM technology. Alonso 3D is a multi-client survey comprising 6,172 km2 located in the Atwater Valley and Lloyd Ridge protraction areas of the US Gulf of Mexico. This project allows TGS to extend coverage from a core area in Mississippi Canyon into a more frontier area that is experiencing renewed interest from E&P companies. TGS acquired new 3D data to provide the higher spatial resolution required to delineate multiple plays at multiple levels. Multi-client 3D survey in the frontier Atwater Valley area of the Central Gulf of Mexico covering 6,700 km2 and leverages adjacent TGS 3D data and utilizes TGS’ Clari-Fi™ broadband processing technology. 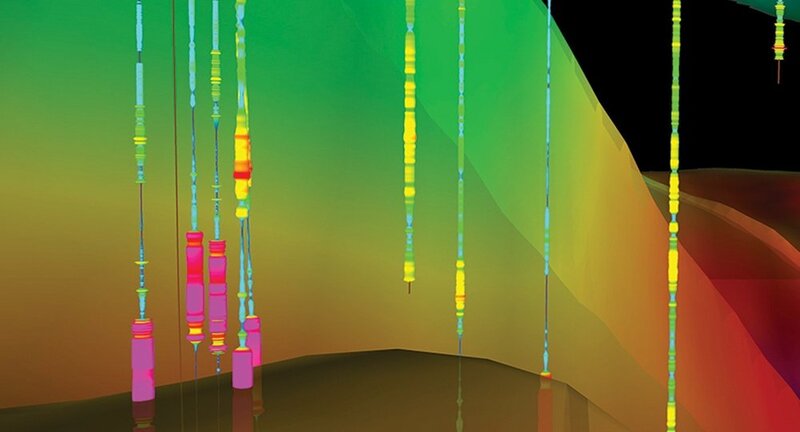 TGS’ Otos multibeam, seep and geochemistry program spans U.S Gulf of Mexico and was designed to mirror the successful Gigante multibeam and sea seep study in the Mexican Gulf of Mexico, conducted in 2016. This program covers approximately 289,000 km2 and includes 350 cores with advanced geochemistry analysis. TGS worked with the same acquisition providers as in the Mexico program, Fugro (Multibeam) and TDI Brooks (Coring and Geochemical analysis). TGS continued its Explorer Series seismic acquisition program in the deepwater U.S. Gulf of Mexico with the addition Panfilo 3D. This project added 11,500 km2 to TGS' multi-client library in the Lund and Henderson Central Gulf of Mexico protraction areas. Acquisition commenced in Q4 2014 with the M/V Polarcus Adira towing 10 kilometer streamers to image regional stratigraphy and deep basin structures. Amerigo 3D, located in the eastern side of the Central Gulf of Mexico through the Lloyd Ridge, Desoto Canyon and Atwater Valley area,s commenced late 2012 and covered 7,000 km2 in the Central Gulf of Mexico. Data processing integrated the new Amerigo data with TGS' modern, adjacent 3D data and applied TGS' broadband processing technology, Clari-Fi™. Fusion M-WAZ reimaging program comprises data covering more than 1,166 Outer Continental Shelf (OCS) blocks (~27,000 km2) from 3D WAZ programs previously acquired by TGS and Schlumberger between 2008 and 2012. This large reimaging program processed data from the Mississippi Canyon, Atwater Valley and Ewing Bank areas using the latest imaging technology to provide a significant uplift in data quality for upcoming licensing rounds. The area is expected to remain a high priority for E&P companies in the foreseeable future. Freedom WAZ 3D is located within Mississippi Canyon and Atwater Valley areas of the deepwater central Gulf of Mexico. The 16,600 square kilometer survey is jointly owned by TGS and WesternGeco. Acquisition was completed in 2009. Liberty WAZ is the sister project to Freedom and extends the contiguous Wide Azimuth data coverage by an additional 3,000 kilometers on the southwest side of Freedom. TGS and Schlumberger jointly acquired the Dual Coil Shooting* multivessel full-azimuth acquisition Revolution XII and XIII surveys in the U.S. Gulf of Mexico. 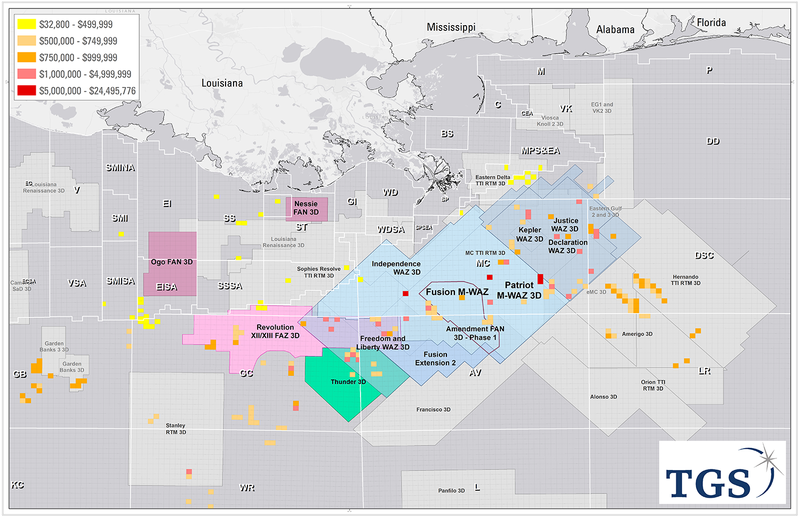 The surveys cover approximately 7,150 km2 (306 blocks) in the Green Canyon, Atwater Valley and Ewing Bank protraction areas of the Central Gulf of Mexico and recorded offsets of more than 14 km imaging below the salt in the deepwater Gulf of Mexico. Revolution Xll and XIII surveys was acquired using the Schlumberger WesternGeco Q-Marine* point-receiver marine seismic system combined with the proprietary multivessel, Dual Coil Shooting acquisition technique, that provided broadband, long-offset, full-azimuth data. This combination of leading-edge technology and technique has improved illumination and imaging of the sub-salt and other complex geologic features in this highly active region. The Justice project is located in the Gulf of Mexico and is a northeast expansion of the existing and contiguous Freedom and Liberty WAZ projects. The survey added more than 7,800 km2 of WAZ coverage to the TGS portfolio and covers portions of the hydrocarbon rich areas of Mississippi Canyon, Viosca Knoll, and De Soto Canyon. In partnership with WesternGeco, TGS commenced acquisition of Patriot 3D multi-client wide azimuth (WAZ) survey in 2011 that spanned 11,655 km2 in the Gulf of Mexico. Patriot WAZ 3D, was the first orthogonal WAZ survey covering a large portion of the existing Freedom WAZ data set. Following the acquisition of Patriot WAZ the data was combined with Freedom WAZ and the resulting image provided the industry with an additional level of subsurface clarity. Multi-client PSDM project ~3,500 km2 acquired by WesternGeco’s four-vessel WAZ fleet, 8100 m offsets, completed June 2012. Independence provided addition seismic data to TGS' Constitution group of WAZ projects, including Freedom, Liberty and Justice, which together total 27,622 km2 in the deep water Gulf of Mexico. Final deliverables became available to clients in 2013. Orion is TGS’ 9,000 meter streamer offset multi-client 3D survey located in the Gulf of Mexico that began acquisition in early 2008. Orion 3D covers approximately 175 OCS blocks (4,100 square kilometers) in the Lloyd Ridge OCS area. The exploration potential for this area includes seismic attribute plays as well as deeper structural opportunities. The Orion 3D program area is located in close proximity to the Independence Hub production facility operated by several independent oil companies. This large facility produces gas from a number of discoveries that have been made in the area including Spiderman, San Jacinto, Atlas Northwest, Atlas, Mondo Northwest and Cheyenne. Orion 3D survey was acquired utilizing the Fugro GeoBarents seismic vessel. The data was recorded with 9000 meter streamer offsets and was processed with both pre-stack time and pre-stack depth imaging by TGS' own Imaging Services division. In addition to the full offset migrations, partial offset stacks have been generated for evaluating Amplitude Variation with Offset (AVO). The Bureau of Ocean Energy Management (BOEM), Department of the Interior held the GOM Lease Sale 252 on March 20, 2019. Click for a breakdown summarizing the bid distribution. TGS offers the industry’s largest digital well log library, available online via R360 ™, specialized data integration services and custom interpretive data solutions to meet the specific needs of each of our clients. 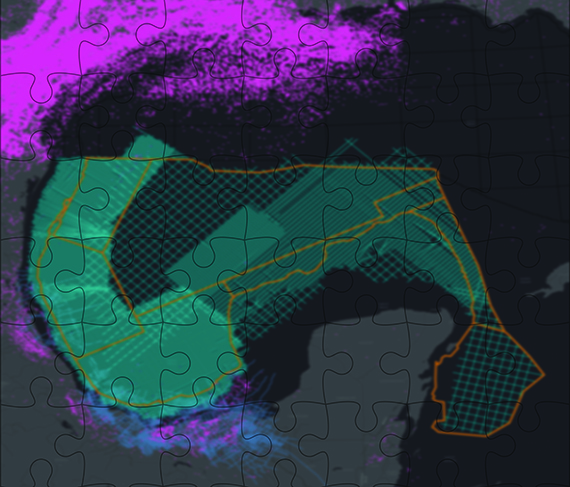 The most comprehensive, continuous Offshore Mexico data set. Only from TGS. TGS delivers industry-leading 2D seismic, multibeam program, geochemistry studies and interpretive studies for offshore Mexico.